Dany Garcia is a groundbreaking visionary, and the definition of a mogul: an entertainment magnate, founder, investor, producer, professional athlete, and philanthropist. Garcia is the architect behind some of today’s most successful enterprises, brands, and talent. Her innovative, global approach to every professional and personal endeavor has contributed to her continued success. Her precise instincts within the ever-changing media landscape, paired with years of experience in the finance industry, have led to innovative and trusted business partnerships in a variety of verticals. Garcia’s passion for bettering the world through socially responsible decisions is consistently reflected in the culture of her teams and the businesses she builds. Garcia is the founder, CEO, and Chairwoman of The Garcia Companies, and TGC Management. Through The Garcia Companies, a complex holding enterprise, Garcia employs one main philosophy throughout every facet of her business; to produce synergy amongst all endeavors in order to maximize success for each individual branch of business. The TGC portfolio is as extensive as it is diverse, and it includes overseeing various ventures in the entertainment and entrepreneurial spaces – TGC Management, Seven Bucks Productions, Seven Bucks Creative, Seven Bucks Digital Studios, Atom Tickets, and CAVA. TGC Management is a global brand development and management company consisting of an elite team of seasoned management executives responsible for guiding strategy and building enterprises for some of the world’s most coveted names and brands. Through her immersive work within TGC Management, Garcia is the visionary behind the careers of Dwayne Johnson and Henry Cavill. TGC Management has built billion-dollar brands by taking risks and changing business models to adapt to the needs of its clients. Garcia also serves as Co-Founder of Seven Bucks Productions, a multi-platform production company pioneering original content for television, film, emerging technologies, and digital networks. Crossing all entertainment verticals, Seven Bucks Productions creates innovative content rooted in authenticity, strong storytelling, and passion. Garcia looks beyond box office numbers and focuses on how a project can make an international impression, create conversation, and impact the social landscape as a whole. The company has an ever-expanding slate including tent-pole movies such as Sony’s highest grossing film of all time, Jumanji, Rampage (Warner Bros.), Skyscraper (Universal), and Fighting with my Family (MGM), as well as upcoming films Jungle Cruise (Disney), Hobbs & Shaw (Universal), The King (Warner Bros.), and John Henry and The Statesmen (Netflix). Seven Bucks Productions also produces original television programming including one of HBO’s highest rated comedies, Ballers, the groundbreaking athletic competition series The Titan Games (NBC), Rock the Troops (Paramount Network), Rock and a Hard Place (HBO Documentary), and the six-episode docuseries Finding Justice (BET). In 2016, Garcia and her team launched their digital arm, Seven Bucks Digital Studios, which creates premium long and short-form content for digital platforms. In less than one year, Seven Bucks Digital Studios amassed over two-million subscribers making it one of the fastest growing channels in YouTube history. A year later, Seven Bucks Creative was launched, serving as the strategic and creative engine behind Seven Bucks and their portfolio of brands and projects. Whether it’s launching an original film, TV show, brand partnership, or new venture, this pioneering group is responsible for crafting big picture and disruptive brand purpose and positioning to drive growth with audiences globally. Through The Garcia Companies, Garcia acts as an advocate for diversity in marketing through investments and executive contributions on behalf of Seven Bucks Productions and Seven Bucks Creative. She serves as an advisory board member for the social media ticketing app and website, Atom Tickets and Mediterranean culinary brand, CAVA. Garcia’s passion and commitment to the entertainment industry is matched by her complete dedication and devotion to the sport of bodybuilding. She first competed in 2011 and went on to earn her IFBB Pro card in 2014. She was the firstever Women’s Physique Division athlete to be signed to the Weider roster. Along with competing, Garcia and Johnson’s digital conglomerate, Seven Bucks Digital Studios has helped produce and promote bodybuilding’s most prestigious and premier competition, Mr. Olympia alongside AMI since 2016. Balancing over 50 other projects in development while simultaneously managing a diverse portfolio of ventures, she continues to serve as a change agent and a multi-faceted trailblazer to women everywhere. Garcia earned a spot in the 2018 Variety500 and in Variety’s Power of Women Report in 2016 and 2018. In 2015, Garcia was selected by Women in Cable Telecommunications (WICT) as a guest panelist for their “Profiles on Champions” which brought together over 1,000 female media leaders for a motivational and empowering discussion on the many traits of successful athletes who have trained their bodies and minds for competitive high performance and challenging environments. Garcia brought her expertise as a driven athlete, female role model, and multimedia mogul to the powerful discussion. Garcia founded The Beacon Experience, as part of the nationwide “I Have a Dream” foundation that encourages at-risk students to continue their educations beyond high school. In 2006, Garcia identified the kindergarten class from Colonial Drive Elementary in Miami and committed to providing the group of “Dreamers” with countless opportunities and resources to help them excel in school. Through the Beacon Experience, she empowered them throughout their lifelong education with weekly tutoring and scholarships for college. Further signifying her belief in the importance of education, Garcia continues to support her alma mater by serving on the University of Miami Board of Trustees and as President of the University of Miami Alumni Association. 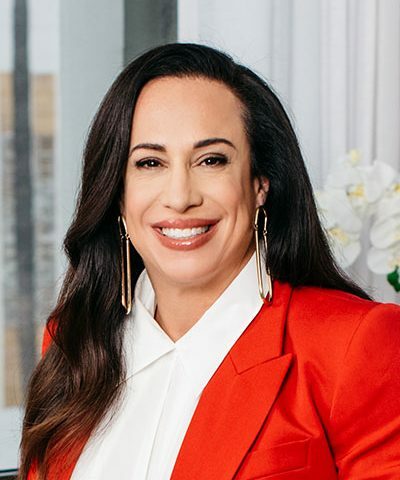 Born and raised in New Jersey, Garcia moved to Florida where she earned a Bachelor’s Degree in International Marketing and Finance from the University of Miami School of Business. Following graduation, Garcia took a job at Merrill Lynch, using the experiences there to increase her knowledge of financial tools, before founding her own private wealth management firm, JDM Partners LLC. 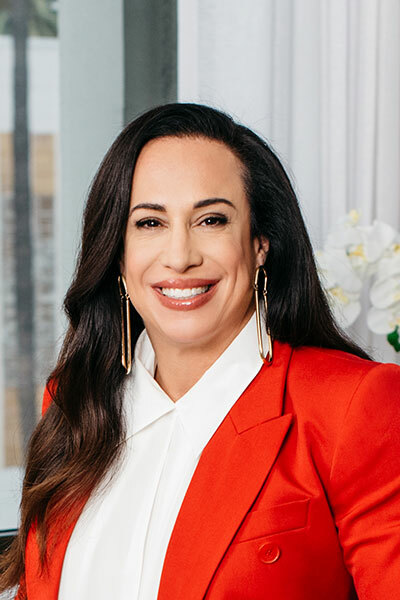 Garcia continues to be an active angel investor, using her wealth of experience to identify and invest in groundbreaking entrepreneurs and business start-ups. Garcia is a proud mom to 17-year-old daughter, Simone Garcia Johnson. Garcia and her husband, Dave Rienzi, split their time between Florida and Los Angeles.